8/24 – Had a very good 5 mile run on the treadmill at home. 8/25 – Ran 4 miles at work and then another 4 miles (wanted to run 5, but ran out of steam) at home on the treadmill. 8/26 – Biked 9 miles at work and then lifted weights. 8/27 – Ran 4 miles at work. It was very humid out. 8/28 – Slow run at work. 3 miles. 8/29 – Resting for the ‘race’. 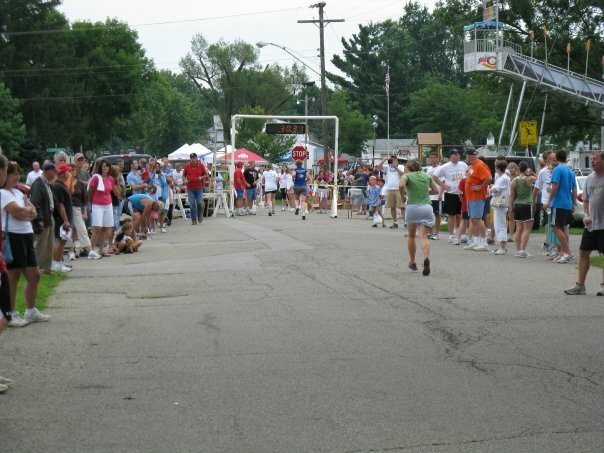 8/30 – 13.1 mile – Spirit of Columbus 1/2 marathon. Overall good run. Second fasted 1/2. I am pleased. I had not gone on the treadmill in ages and was very surprised I was able to hold a contant pace of 5.2 on it. In the past I’d die at 4.5. During the week I wasn’t as dilligent about what I ate as I had been in the past. Training for the Columbus (1/2) marathon starts Monday! I have some major school stuff (finals) I need to get out of the way and then I’ll be breathing easier! I did not step on the scale most of the week. I did some “carbing” in the later part of the week for the 1/2 marathon and didn’t want to step on the scale. 8/15 – 12 miler at home. Good run. Notes: What a long week! Worked at a forum two days for my employer; it was fun, but I was on my feet all day. My right knee did not like that, so I didn’t run those two days. Did go camping Saturday to Sunday, that was fun! Had a very solid 12 miler on Saturday and another strong 5 miler on Sunday. 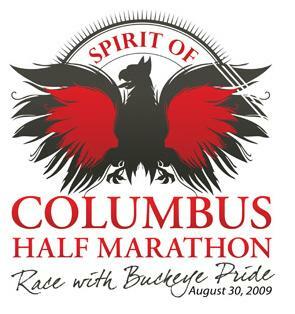 Two more weeks to go until the Spirit of Columbus 1/2 Marathon. I think I am ready. Stressful week. Working outside the office is not good on the weighloss program. But I managed to shake one pound. Charging towards the finish line! This is at the finish of the Baltimore Festival 5k. 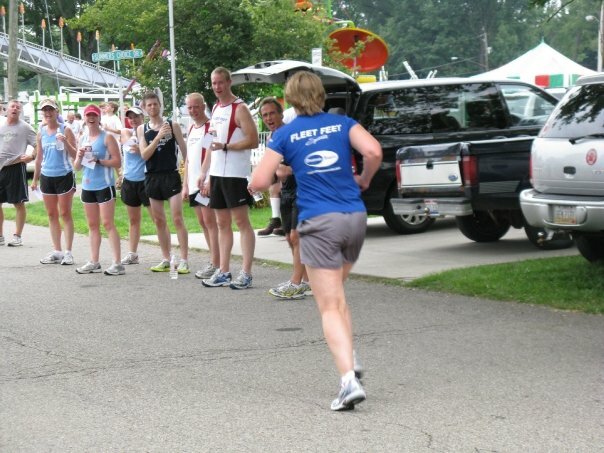 All those peeps in the above picture are from my running club (who are much faster than I am) and they cheered me on. It was great having them there. 8/5 – 4 miles @ home….horrible run…stomach cramps!!! 8/8 – Slow 5 miler at 6 am, then at 8:30 ran the Baltimore Festival 5 miler in 30:32 (short course 3.03, equals 10:04 min/mile) I am very happy with that. Notes: Had a good week running wise. was able to get 30 miles in even though I had my doubts that I would. Had a good 5k race and plan on a major PR for that next year. I have a busy work schedule next week and I am not sure what I will be able to get done. I ate crappy. Got too relaxed about what I ate. Need to pull the reins back in and get back on the wagon. Of course it didn’t help that it was that dreaded time of the month. I’ll put that behind me and look for another week like the previous week. 8/01 – 12 miles at home, crappy run, stomach cramps at mil 8.5 for 2 miles; ran out of water (ran 2 hours later than usual), hot & dehydrated even though the weather wasn’t too hot. Notes: This week I ran 30 miles, which I am hoping will become an average; however, I am noticing that I am more aggitated and I am worried that it has to do with the increased mileage. I will monitor that. There is a lot on my plate next week and I am not sure if I’ll be able to get my mileage in. 13 lbs down 14 to go!